In an environment of increasing competition and eroding trust, nonprofits are under pressure to up their ability to deliver on their mission. Stewardship is a paradigm-shifting way to view your role, your board, your staff, your funders, and yourself. Understanding that the nonprofit is rooted in its ownership by the community helps break the boundaries of turf and fragmentation that prevent sustainable impacts. 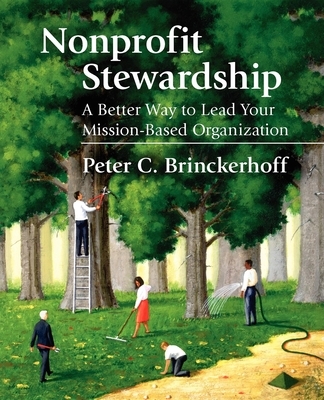 Author Peter Brinckerhoff, internationally known expert at helping not-for-profits get more mission for their money, explains why stewardship is the smart thing to do and how you can use it to transform your organization. You'll discover: The eight characteristics of a mission-based steward; The various stewardship roles that exist in your not-for-profit, and why each is essential in a well-functioning organization; Three surprising truths about your not-for-profit; The nine characteristics of a successful not-for-profit; Fifteen warning signs of trouble in your organization; Stewardship-rich ways to view your finances, your budgeting, and your financial reporting; A refreshing new perspective on the relationship between funders and not-for-profits; Crisis management tools that really work; A stewardship self-assessment to use now as a starting point, and later as a reference point to measure your progress. Comprehensive, passionate, and practical. Dozens of real-world examples make this book relevant. End-of-chapter discussion questions reprise key points and reinforce important ideas. Nonprofit Stewardship is recommended for leaders of all types of not-for-profit organizations serving individuals, the local community, the state, the nation, or the world. Also recommended for donors, grantmakers, government agencies, and others who fund your work.